Your have to keep breaking your heart until it opens. My energy changes in June as if my batteries are recharged in a new and unique way. This month is the month of solstice, the longest day of the year. 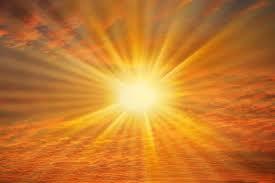 The sun pours down, into every pore in me, as if it is reminding me that my energy is derived from the sun. I can see why people have blinded themselves worshiping the sun. There is some growing plant within me that photosynthesizes with the sun. I am done growing physically yet the sun grows my soul, it feeds some part of my spirit that is otherwise malnourished. The energy renewal helps me focus on expansion, breathing into the heart. I try to breathe more deeply, as if with this breath I can water my soul and assist in its growth.